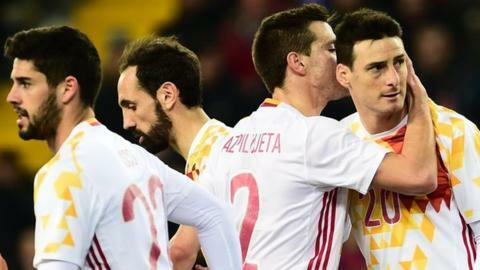 Veteran Athletic Bilbao striker Aritz Aduriz marked his first international start by earning reigning European champions Spain a draw against Italy. The Azzurri led when Napoli winger Lorenzo Insigne clinically swept in after a home counter attack. But 35-year-old Aduriz, who has scored 31 goals for his La Liga club this season, levelled two minutes later when he pounced to bury a loose ball. Both teams are preparing for this summer's Euro 2016 finals. Spain have been drawn in Group D with Croatia, Czech Republic and Turkey, while Italy face Belgium, Republic of Ireland and Sweden in Group E.
Aduriz is targeting a place in Vicente del Bosque's 23-man squad and boosted his ambitions by netting in only his second Spain appearance - which came six years after his debut. Elsewhere, Ukraine - who face Northern Ireland in Group C - edged past Cyprus in a 1-0 home win. Turkey beat fellow finalists Sweden, winning 2-1 in Antalya thanks to Besiktas forward Cenk Tosun's brace. Former Wigan defender Andreas Granqvist replied for the visitors, who rested star striker Zlatan Ibrahimovic ahead of Tuesday's game against the Czech Republic. Iceland, drawn alongside Austria, Portugal and Hungary in France, lost 2-1 against Denmark, who failed to make the finals. Match ends, Italy 1, Spain 1. Second Half ends, Italy 1, Spain 1. Corner, Italy. Conceded by César Azpilicueta. Foul by César Azpilicueta (Spain). Lorenzo Insigne (Italy) wins a free kick in the defensive half. Substitution, Italy. Jorginho replaces Marco Parolo. Substitution, Italy. Lorenzo De Silvestri replaces Alessandro Florenzi. Corner, Italy. Conceded by Koke. Offside, Spain. Jordi Alba tries a through ball, but Paco Alcácer is caught offside. Substitution, Spain. Paco Alcácer replaces Álvaro Morata. Attempt missed. Álvaro Morata (Spain) right footed shot from outside the box is just a bit too high. Assisted by César Azpilicueta. Cesc Fàbregas (Spain) is shown the yellow card for a bad foul. Foul by Cesc Fàbregas (Spain). Simone Zaza (Italy) wins a free kick in the attacking half. Álvaro Morata (Spain) wins a free kick in the defensive half. Foul by Matteo Darmian (Italy). Substitution, Italy. Luca Antonelli replaces Emanuele Giaccherini. Substitution, Spain. Jordi Alba replaces Juanfran. Corner, Italy. Conceded by David de Gea. Attempt saved. Lorenzo Insigne (Italy) right footed shot from outside the box is saved in the top left corner. Assisted by Federico Bernardeschi. Federico Bernardeschi (Italy) wins a free kick in the attacking half. Attempt missed. Lorenzo Insigne (Italy) right footed shot from outside the box is close, but misses to the right from a direct free kick. Gerard Piqué (Spain) is shown the yellow card for hand ball. Hand ball by Gerard Piqué (Spain). Substitution, Spain. David Silva replaces Aduriz. Goal! Italy 1, Spain 1. Aduriz (Spain) left footed shot from very close range to the top left corner following a set piece situation. Attempt saved. Álvaro Morata (Spain) header from the centre of the box is saved in the centre of the goal. Assisted by Cesc Fàbregas. Marco Parolo (Italy) is shown the yellow card for a bad foul. Koke (Spain) wins a free kick in the attacking half. Foul by Marco Parolo (Italy). Goal! Italy 1, Spain 0. Lorenzo Insigne (Italy) right footed shot from the centre of the box to the bottom right corner. Assisted by Emanuele Giaccherini. Offside, Italy. Leonardo Bonucci tries a through ball, but Lorenzo Insigne is caught offside. Attempt saved. Alessandro Florenzi (Italy) right footed shot from the right side of the box is saved in the centre of the goal. Assisted by Lorenzo Insigne. Substitution, Spain. Isco replaces Thiago Alcántara. Substitution, Italy. Federico Bernardeschi replaces Antonio Candreva.